Researchers are becoming increasingly more ‘open’ in their research, through open access publication, open data, and their social media presence. What is the impact on the professional development of researchers as they navigate the open research environment? How do these changing expectations impact the role of researcher developers? A wide range of organisations involved in research have ‘open’ on their horizons. Governments, policy makers, funders and the public globally have increasing expectations that the outputs of publicly funded research should be available for the public good. The European Commission recommends strengthening of the knowledge-based economy through open science and open innovation. Institutions are focusing effort on open access, institutional repositories for publications and data, the digital infrastructure to make ‘open’ possible, and the greater engagement of the public and research users at all stages in research. As part of the Vitae annual programme, we are launching the Open Researcher theme which will explore the development of the next generation of researchers. We are excited to to let you know that we have now opened the bookings for our first event dedicated to supporting ‘Open Researchers’. Join us on the 1st December in Leeds as we explore the potential career benefits, both within an academic career and beyond, and define the knowledge, behaviours and attributes needed for success in this environment. This event is open to all stakeholders in the professional development of researchers in an open research environment, including researcher developers, staff developers, careers advisors, representatives of funding councils and charities, senior academics and managers. Book your place now, as we expect demand to be high for this ground breaking event! This event will be just one in the series of activities focused around Open Research during the next few months. 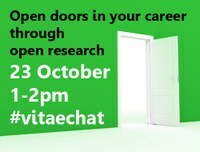 To coincide with the Open Access week (19-25 October), we will be hosting a Twitter chat on the #vitaechat channel, between 1 and 2pm on the 23 October entitled: “Opening doors in your career through open research”. During this live Twitter chat, the host will lead participants through a discussion of the potential career benefits and opportunities associated with open research, as well as the steps researchers need to take to prepare themselves to be effective in an open research environment, both within an academic career and beyond. Visit our Focus on page from the 19 October for more updates on the theme.